I spent the weekend under the weather. It all came on Thursday night, Friday I slept through my to-do list while the dog stared at me. Friday night I no-showed to my writing group and a reading that I had on my calendar for 6 months. Saturday I tried to run errands, but ended up back in the car and back on the couch. Eventually I made it to daughter’s soccer, where I sat and spent the rest of the day alternately between cleaning and resting. Saturday night I finally ate something and immediately regretted it. At that point I had a duathlon starting the next morning in less than 12 hours. I was torn. What if I felt better when I woke up? What if I didn’t wake up in time? What if I still felt like crap? I decided to defer my entry to the race. Which was a good decision because even Sunday I didn’t want to eat, or move. Yet I made it to a coffee shop and a playground with daughter. By Sunday night I was moving a little faster and even stayed up late enough to watch the finale of Mad Men. And then I found this sweet note from little girl. 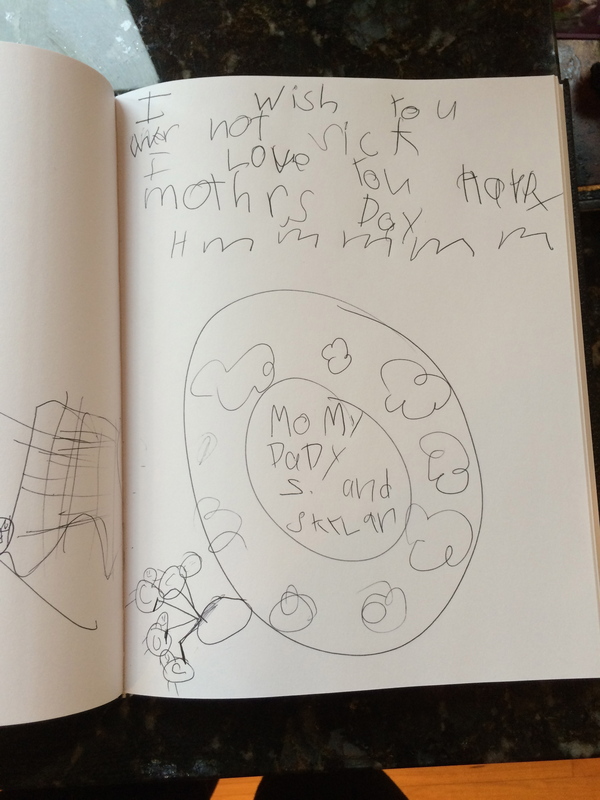 I’m not sure when she wrote it, but it was clearly in response to my pleas of , “Mommy doesn’t feel good, please be patient.” My heart broke. And then burst.